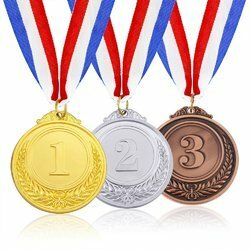 Our range of products include dye punch medal, customize numeric medal, tvs medal, sports medal, jaguar medal and crown medal. We are considered as most famous organization in market, engaged in offering wide range of Dye Punch Medal in the domestic market. These are manufactured by utilizing supreme quality raw material which is sourced from reliable vendors of market. With the help of progressive technology, these are rigorously examined by our quality analyzers to ensure their quality. By keeping track with the market development, we are engaged in offering Numeric Medal . These medals are broadly used in award ceremonies, annual day functions, seminars and conferences as souvenirs. Keeping in mind the diverse requirement of our clients we are involved in offering a wide gamut ofTVS Medal. 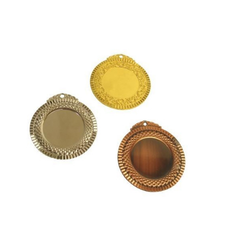 Our ranges of TVS Medal are extensively used in different industrial sectors. They are excellent finished during the whole processing in our organization. We are considered as one of the trustworthy and prominent organization of this industry, due to our utmost efforts for maintaining the quality. Furthermore, our products range is available at market leading prices. 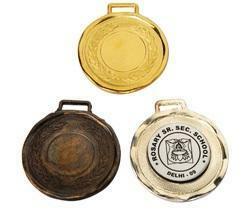 Our company is highly esteemed in offering Sports Medal to the clients. Sports Medal is manufactured using quality material and essential components with ultra modern technology by expert professional. This product is stringently inspected on certain parameters of quality to rule out every possibility of defect before the final dispatch. Offered range has an impeccable finishing, optimum finish and attractive designs that create an aesthetic appeal to them. This product is acknowledged amongst customers due to its perfect finish and accurate dimensions. Offered range can be customized as per need of customer. 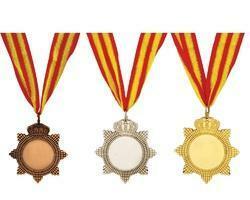 Being at remarkable position in this industry, we are providing a wide array of Jaguar Medal. We are highly affianced in offering a huge array of Crown Medal to reputed customers.